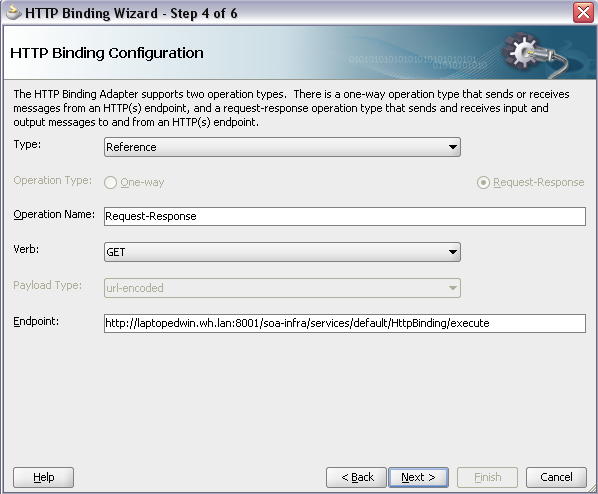 With Patch Set 2 of Soa Suite 11g Oracle added the HTTP Binding to the supported Adapters. This Adapter was already a feature of Soa Suite 10g, so it is great news that is back. 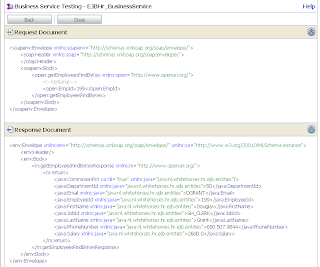 So when your HTTP Service returns a XML message then you can use this binding in your composite application. When the HTTP Service has a JSON response then you can use the Spring Context Component ( With PS2 Spring Context is supported ). Lucas made a great example how you can achieve this. In this blogpost I will show how you can use this HTTP Binding as a Service or as a Reference Adapter. I start with a Service so I can use this Service later in the Reference Adapter. Drag the HTTP Binding from the Component Palette to the Service part of the Composite. Use Service as Type and when you want to have this Service, to return a message then you should select Request-Response as Operation Type. 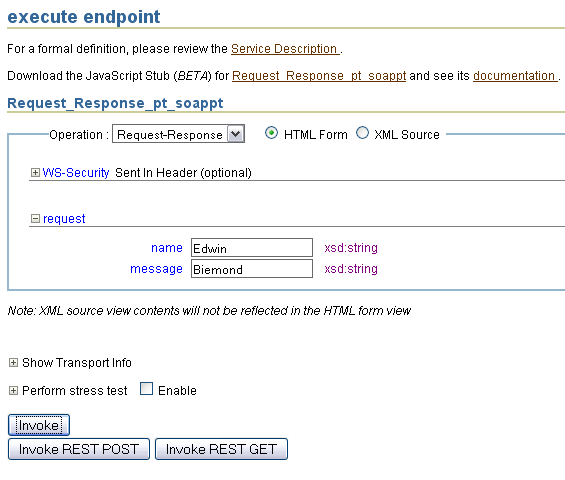 Provide the Request and Response XSD and choose the right element. 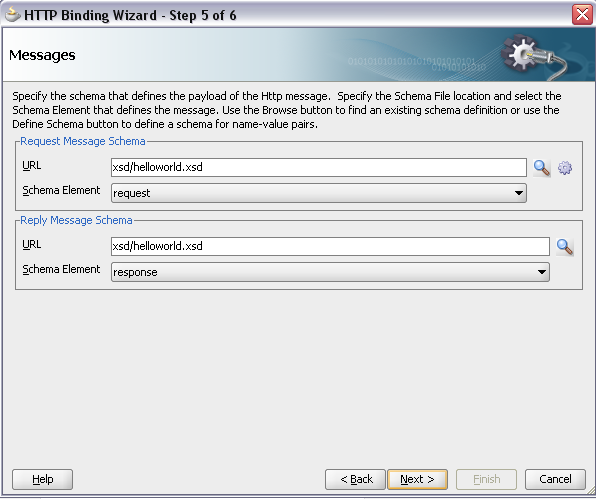 For the Request Message Schema you can also use the wizard. Next step is to wire this Service to a component. 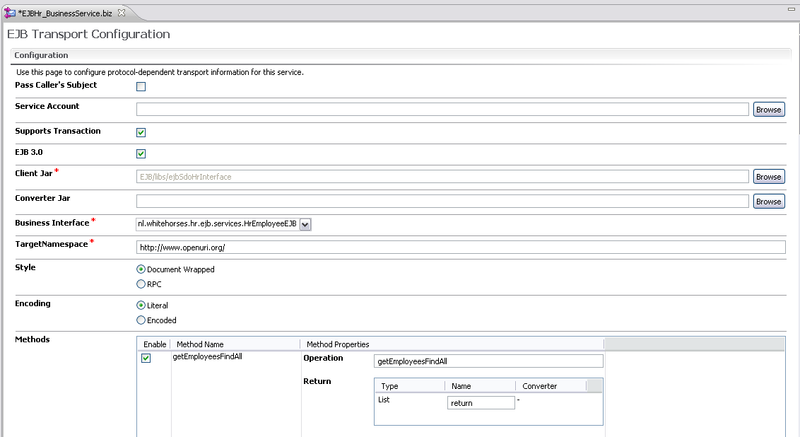 Choose a BPEL component and use the Define Service Later template. 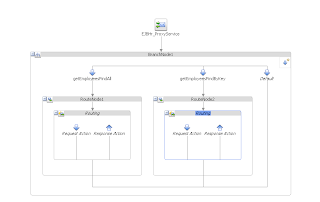 Make a wire between the Service and the BPEL component. 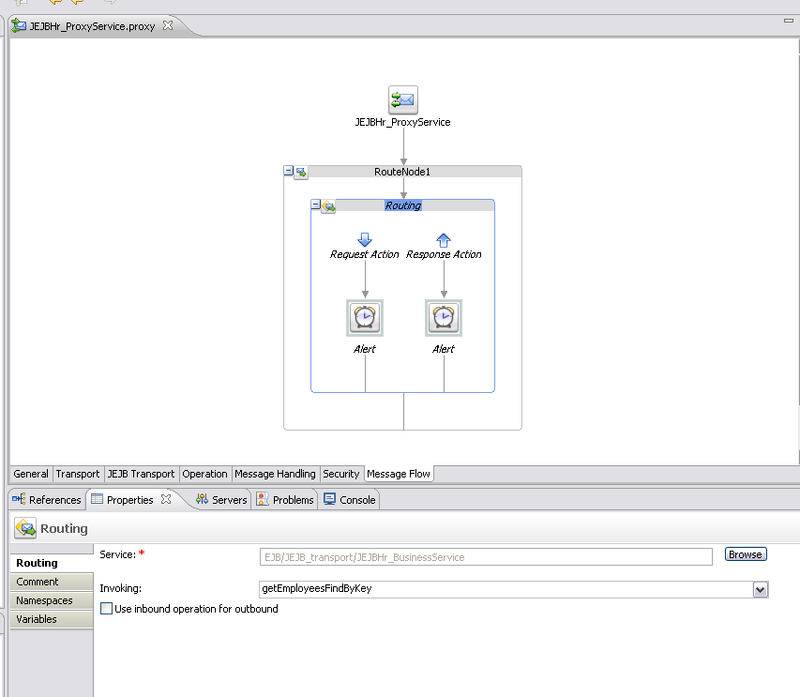 Open the BPEL component and a Receive and Reply Activity and finish your BPEL. When everything is valid then you can deploy this to the Soa Suite Server. 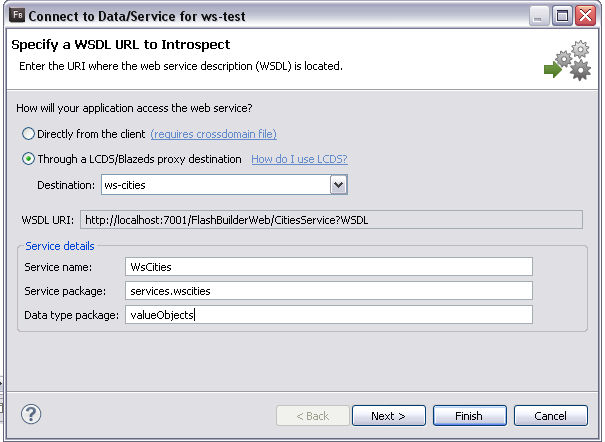 For this HTTP Binding Service Soa Suite adds two Port types to the WSDL. This means you can also invoke this Service with a SOAP message. This one is better then the tester of the Enterprise manager. The HTTP binding can also be used as a Reference adapter. 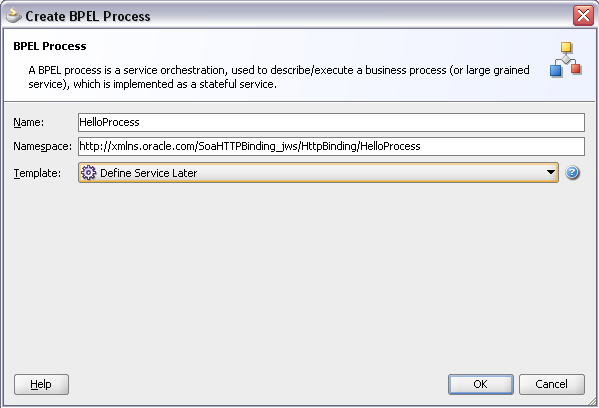 For example you can use the just created Service as Endpoint. 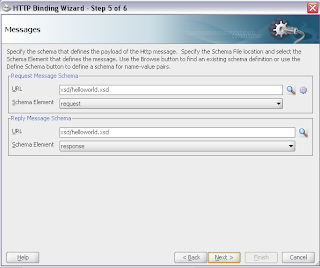 Provide the Request and Response Schema's. 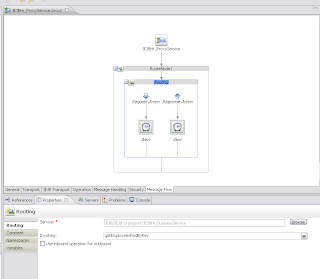 To test this Reference Adapter you can add a Mediator component with the same Request and Response Schema's. Expose this Mediator as a Service and wire the Reference Adapter to the Mediator and complete the routing rule. 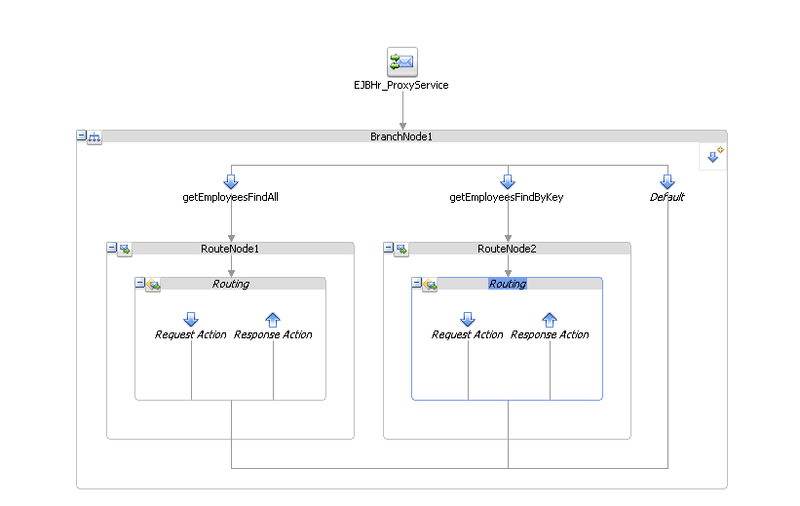 Deploy this composite application, invoke the Mediator Service and take a look at the instances in the Enterprise Manager. and in here I also have a txt file with all the request I did with the Wfetch tool. Testing of HTTP Binding adapter works from the browser just fine. It's just that how you pass the parameters. I created a simple composite application with one input parameter and exposed it as REST service using HTTP binding adapter (GET). The service does nothing but add a string to the input parameter and returns back. All along until now I was trying to use this URL from test console or from the browser. ...but this never works. It's not the right way to use it. If you try this it will return page not found. Notice the changes in above URL. The Request-Response is not just after HTTPBindingService (as before), instead its passed as a parameter of operationName. The above URL works just fine from browser and test console. The auto generated Test URL in test console is misleading. 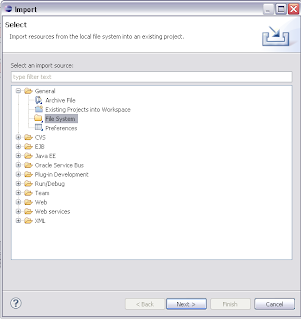 For JDeveloper 11g you can now download a Maven plugin which helps you to make a new project which follows the Maven project folders lay-out and also creates the pom.xml. For more information about this plugin and how it works in JDeveloper see this OTN article of Dana Singleterry. The next step in this Maven tutorial is to deploy to a Weblogic Server from Maven. 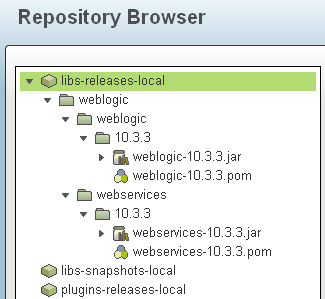 To make this work you need to have a Maven Repository, where you can upload the required weblogic jars. In this blogpost I use Artifactory of JFrog. 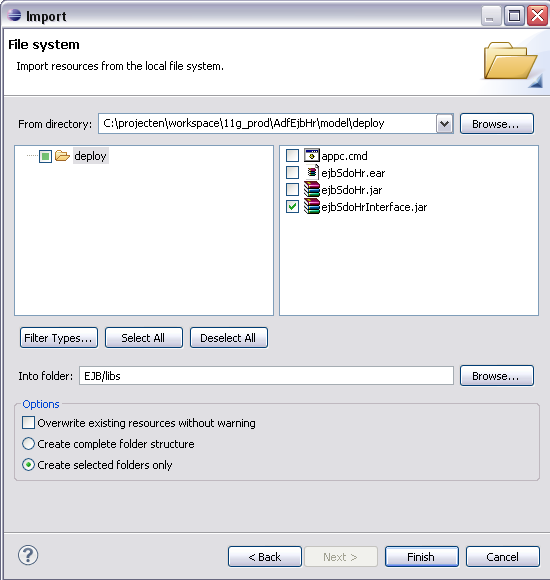 Download the standalone zip and start the Maven repository. 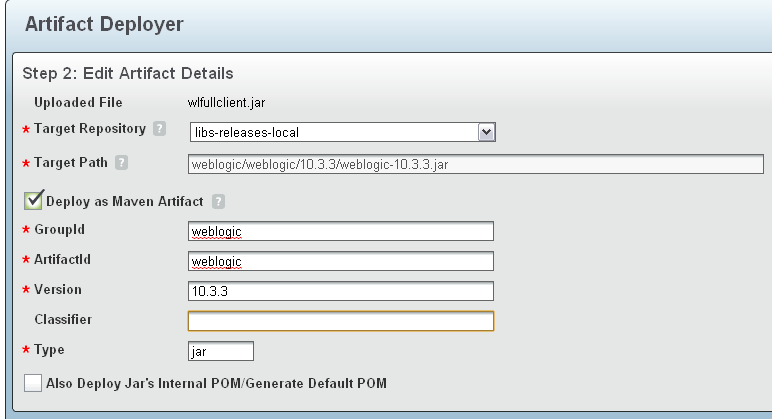 I don't want to upload a lot of Weblogic jars to this repository, so I will generate a Weblogic FullClient jar and use this instead. Go to the artifactory Web Application, in my case http://localhost:8081/artifactory/webapp/home.html where you need to log in to upload the new jars. Use admin / password as username and password. When you take a look at the Repository Browser you need to see this. The next step is to configure the Maven settings.xml Here you need to add a server configuration, a development profile and make this profile active. The server entry is needed to successful upload your project snapshot to the repository ( distributionManagement in the project pom) and the dev profile is used for the Development Weblogic Server properties and to define the Maven repositories. 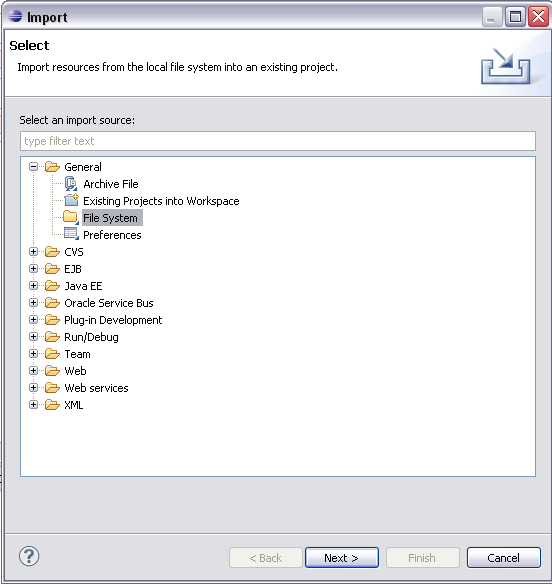 The project pom with the weblogic-maven-plugin. This plugin uses the weblogic properties of the dev profile and has the two weblogic jars as dependency. 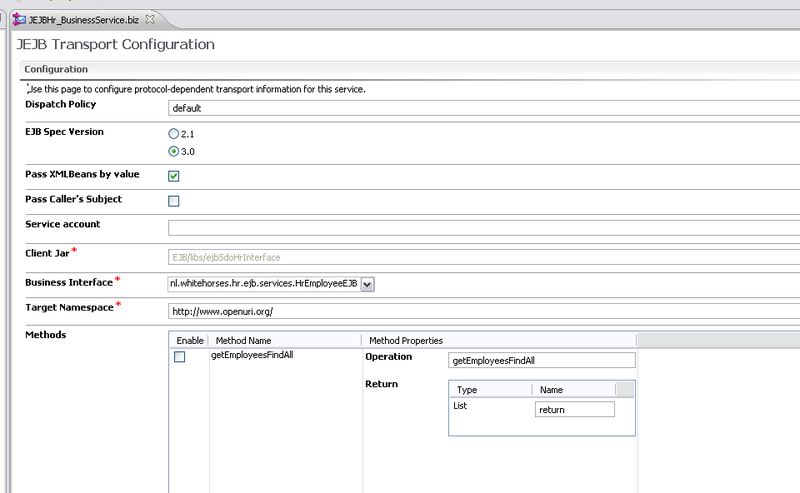 For deploy you need to configure distributionManagement, Maven will upload the snapshot to the artifactory repository. 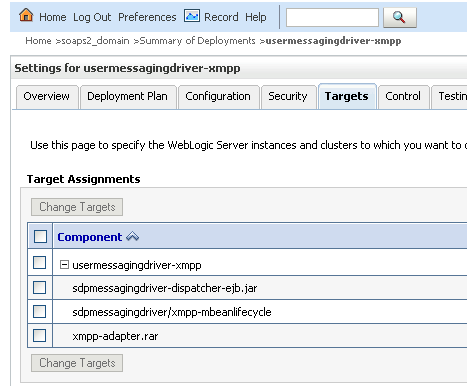 Now you can use mvn deploy and this will deploy your project to the Weblogic Application server. ( when it fails on Windows with a strange Mbean error then this can be caused by, you are using a space in the local repository path ). 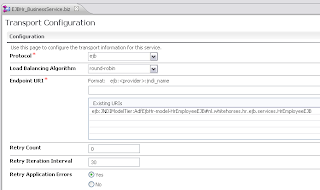 With the 11g release of OSB EJB3 is supported in the EJB SB transport. Now you can use all your Remote EJB's of your Model Tier. 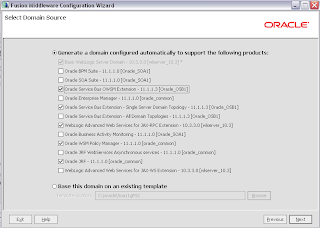 This is not all, Oracle also added a new Transport called JEJB. This works almost the same, only now you are passing Plain Old Java Objects (POJOs) through the Service Bus. 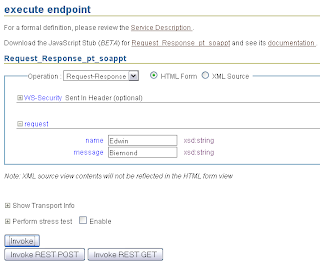 With the EJB transport the Java Web Services (JWS) framework is used ( easy for transformations ). 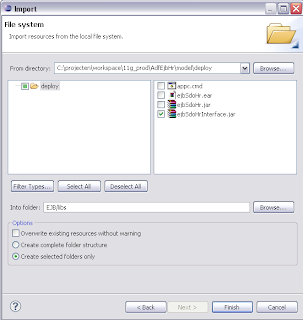 With JEBJ you can also use a Java Interface in a Proxy Service and expose this Proxy Service as a Remote EJB. 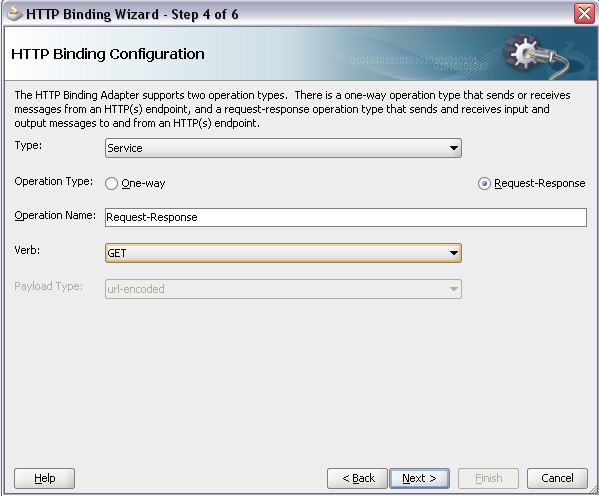 So you can remove the existing EJB and replaced it with this Proxy Service. Or add some logging or java transformations between the Proxy Service and the original EJB in the Business Service. 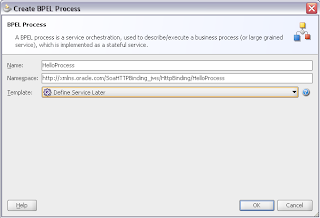 When you are not using a JEJB Business Service for this Proxy Service then you need to add a java callout in the response and return the right POJO. 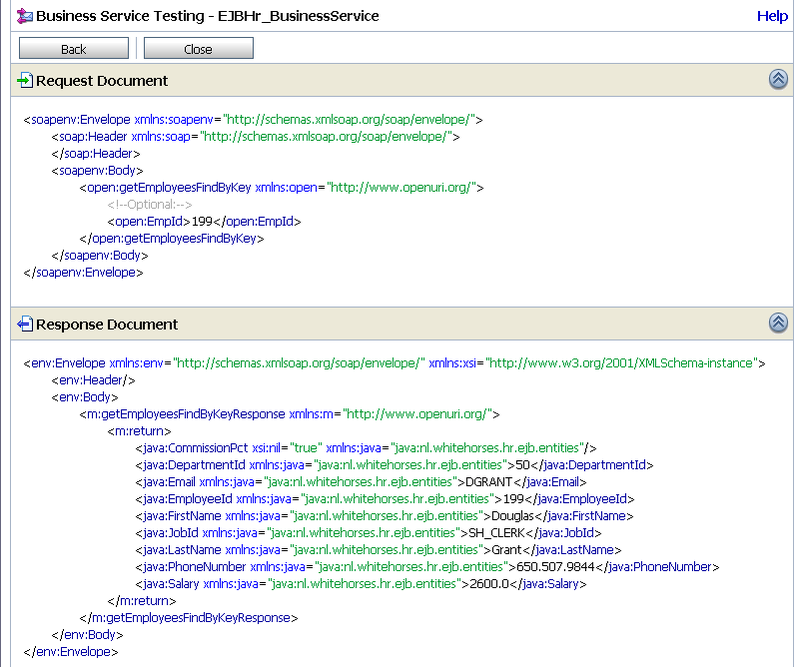 Soa Suite 11g also has this feature to expose a service as a EJB. So lets give it a testdrive. If your remote EJB is running on a different J2EE Server then you need to add a JNDI provider for your EJB or JEJB Business Services. 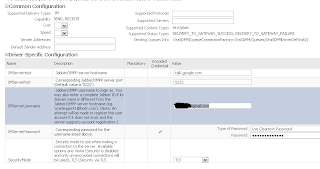 Provide the provider Url and the username / password. 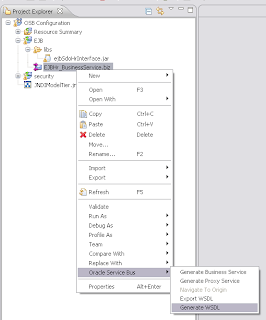 Create a service interface jar of your remote EJB. ( This jar must not contain the Bean or the persistence.xml , just the entities and the remote interface ). Import this jar in your OSB project. Select File system. Browse to your deploy folder and select the Service interface jar. 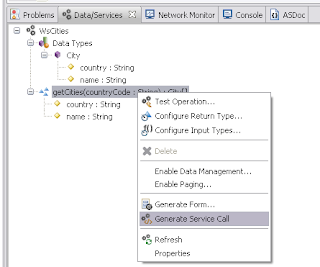 Create a Business Service with a Transport Service Type. Select the EJB protocol and use this ejb:JNDIModelTier:XXXXXX as an endpoint URI. 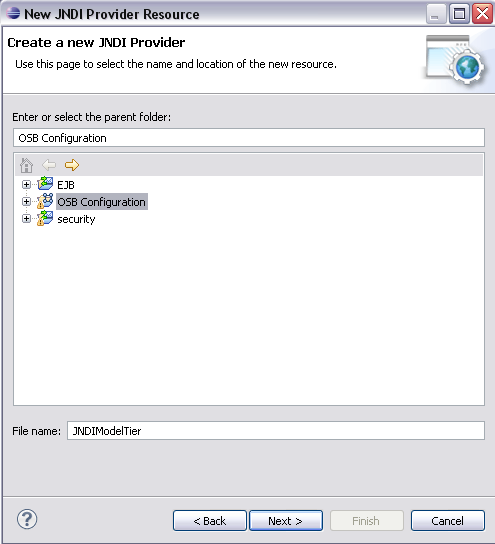 JNDIModelTier is the name of the just created JNDI provider and XXXX is the JNDI name of your remote EJB. 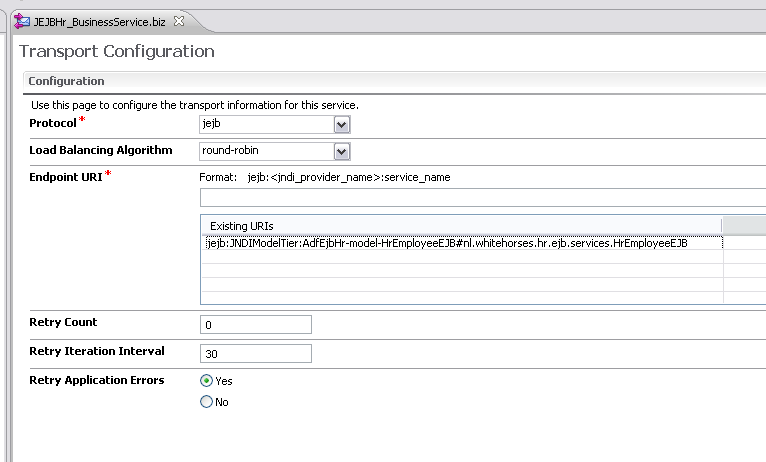 In the EJB Transport Tab you need to enable EJB 3, add the service interface jar and select the remote interface. You can enable / disable some methods or change the names of the input or output parameters. 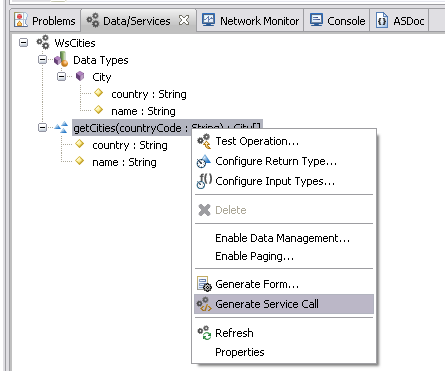 Deploy your project to the Service Bus and test the business service in the sbconsole. Next step is to make a Proxy Service on this Business Service. Generate and save the WSDL on this BS. 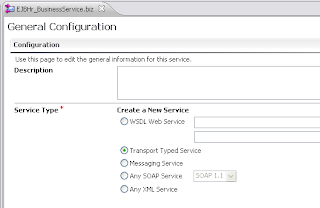 Use this WSDL in the proxy service and add in the Service Flow some Operation branches and use the EJB Business Service. The JEJB Transport works the same, only now, plain java object are transfered. Select JEJB as protocol and as Endpoint URI jejb:JNDIModelTier:XXXXX , JNDIModelTier is your JNDI provider and XXXX is the JNDI name of your remote EJB. 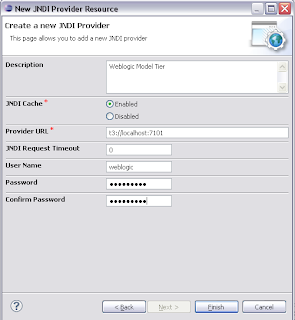 Select the EJB 3 option, add the Service Interface jar and select the remote interface. To test it ,you can make a Proxy Service where you use JEJB as protocol. The Endpoint URI is now JEJBHr_ProxyService. 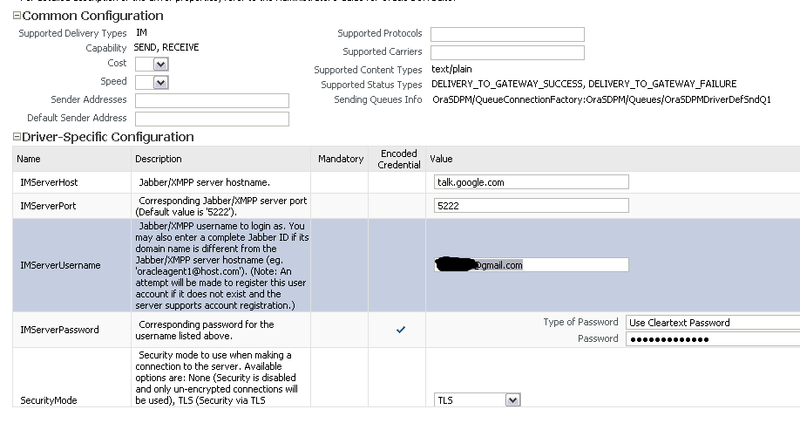 You need this when you try to do a JNDI lookup of this proxy service like context.lookup("JEJBHr_ProxyService#nl.whitehorses.hr.ejb.services.HrEmployeeEJB") then a # followed by the remote interface used in this Proxy Service. Call the JEJB Business Service and Add some Alerts in the request and response. For the request the body contains a nice XML for the response you only get a reference to the POJO. To do something with the response you need to add a java call out. 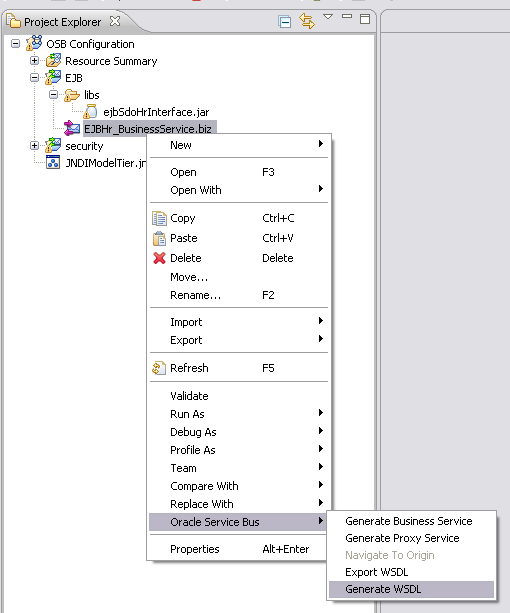 Make a EJB client and connect to the Oracle Service Bus and lookup the proxy service. 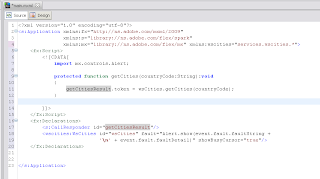 In Adobe Flex Builder 3 it could be hard to map the data of a remote object or a web service to a FLEX component like a datagrid. 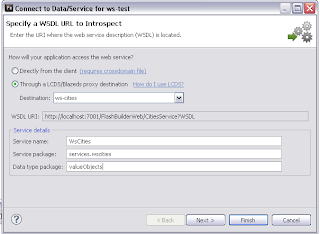 With the help of a RDS Servlet in combination with BlazeDS or LifeCycle Data Services you can connect from Flash Builder 4 to your Back End Web Application and generate the required client side code and map this to a Flex component. This also works for a XML file or a Rest Service ( need crossdomain security configured ). Before you can use it in FB4 you need to download BlazeDS 4 ( Binary Distribution ) and Adobe LifeCycle Data Services ( you only need the flex-rds-lcds.jar ) Add these jars to the WEB-INF/lib folder and provide the BlazeDS configuration files. 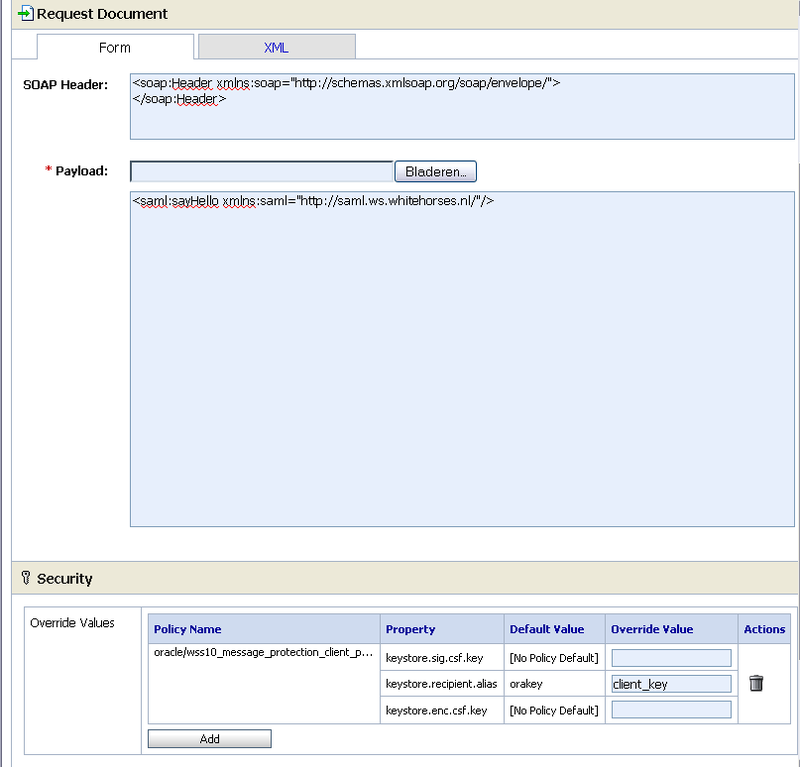 It will look like this..
Configure the web.xml with the required RDS and BlazeDS servlets and mappings. 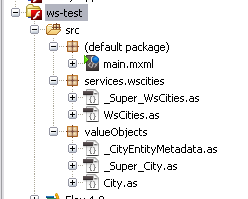 As a demo I created simple getCities JAX-WS service and added this as a destination in the proxy-config.xml of BlazeDS. Press finish and this will generate the client side code of this WS in your FB4 project. 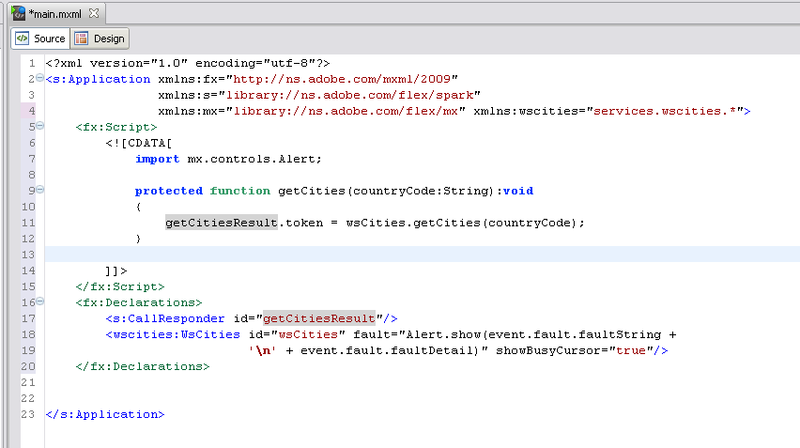 This will generate some code in the mxml to call this getCities Operation and handle the result. Add a datagrid and Bind this to the GetCities Data provider. 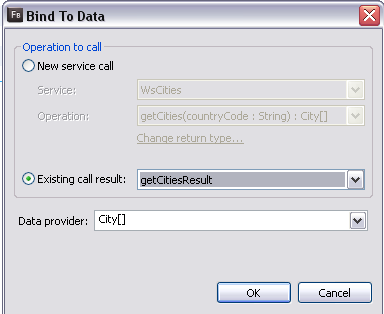 Use the Existing call result. 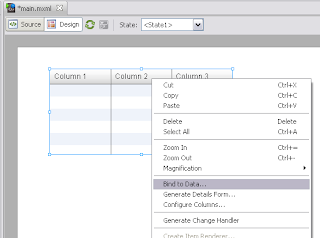 FB4 will now change the DataGrid with the right columns. 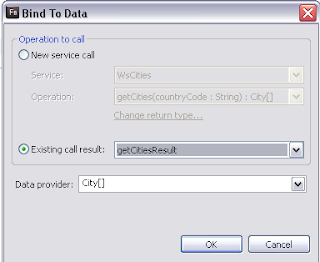 That was the hard part and now you can finish this by Adding a Combobox to provide the input for a getCities operation. If you don't like these mouse clicks you can always do it manually in actionscript. 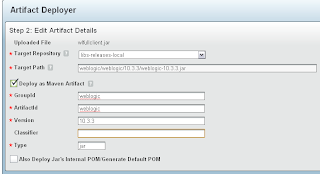 In Weblogic it is not so hard to make a WLS Cluster for your java applications or make a Fusion Middleware cluster for your ADF, Webcenter applications or SOA / OSB processes. 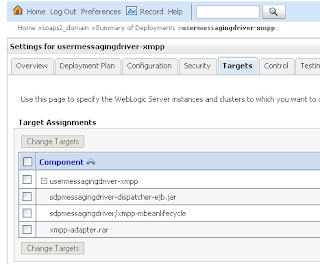 But to remotely control this cluster from the console web application you need to setup nodemanagers. If you want to go a little step further and also wants High Availability you need to enable and setup Server Migration in Weblogic. Server Migration only works when you use nodemanagers on all your servers. You can choose for a script nodemager so called SSH nodemanager or for a Java nodemanager. And the question is, which nodemanager should you choose. When you have a normal Weblogic domain ( Don't enable any of the oracle_common options in the Weblogic domain wizard) then you can follow the SSH node manager guide. 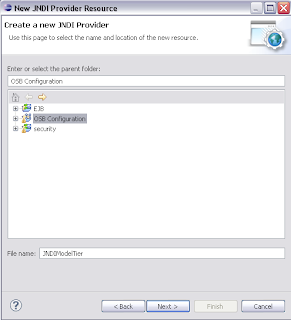 In this guide you will make a ndmgr account where you copy the weblogic domain from the main domain location into the home directory of ndmgr account. 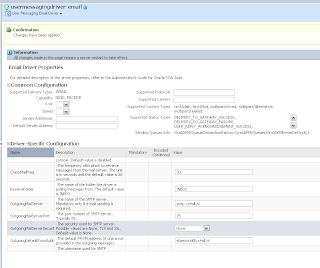 Enable SSH without password between the weblogic and nodemanager accounts. The Admin Server will fire remote scripts over SSH to control the Managed Servers. There is no agent running only scripts. I think the SSH nodemanager is also possible with a Fusion Middleware Cluster but you can't create or use a ndmgr account and copy the domain to a home directory or to an other path. 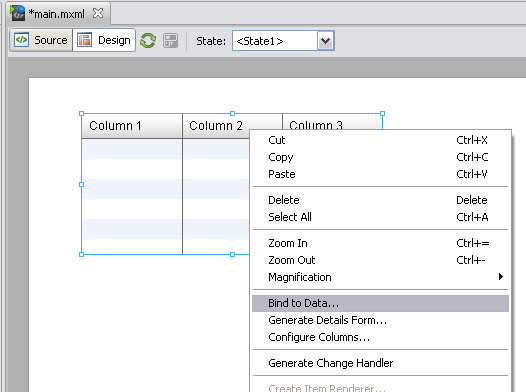 In Fusion Middleware you can copy the domain to a new folder next to the orginal domain. ( the java jars /ears are loaded on startup with a relative path so in a other path it can't find the ears) and use this domain for your managed servers. So don't use the SSH nodemanager with FMW. For a normal weblogic domain I would choose for SSH , because you can copy domain to the home directory of an account. 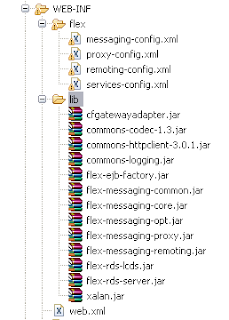 And the nodemanager does not take any resources. Test adding a new ip address with the weblogic script. 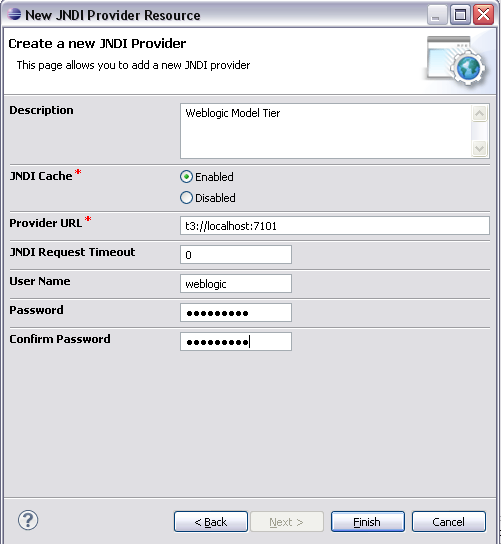 The next step is create a Weblogic domain and copy this to ndmgr account. Go to the bin folder of your local domain and change in each script the domain variable value to the home directory path. You can test it when you log in as oracle and try to ask the status of a managed server. The SSH nodemanager does not have a nodemanager.properties file so you need to change the settings in the oracle/Middleware/wlserver_10.3/common/bin/wlscontrol.sh file. In our case you need to add the network device name and subnet mask. 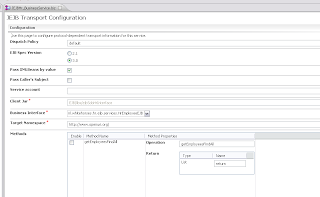 The last part of the SSH node manager is to configure these node manager in the weblogic console. For you can configure the nodemanager you need to start the node manager once. This will create the nodemanager.properties file. For secure communication between your Admin Server and the Java Nodemanamger you need to create some certificates. wls1.local matches with my machine name. Important for hostname verification. 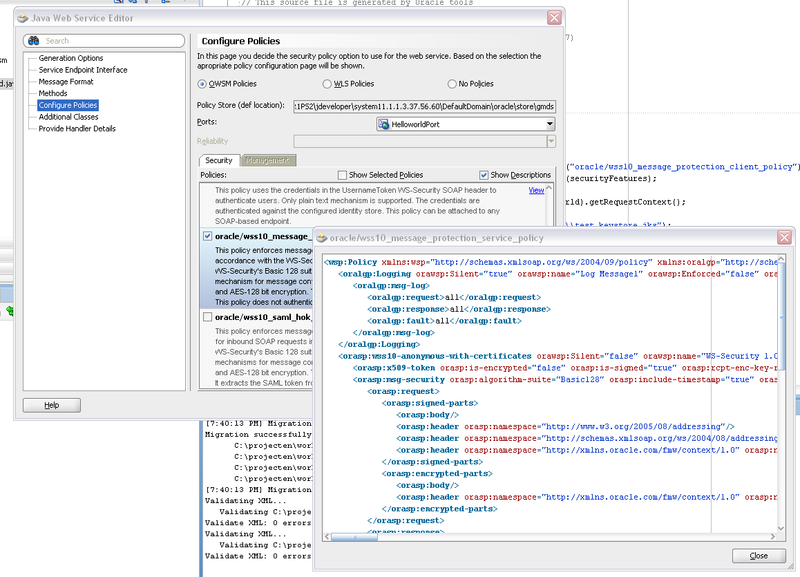 you are ready with the nodemanager configuration and can go to the weblogic console application. To enable server migration you need to have a database with a table called ACTIVE. The scripts for all database are located at /oracle/Middleware/wlserver_10.3/server/db. for HA you can choose Oracle RAC or MySQL Cluster ( the community edition , this is very light and free ). See this chapter how to configure WLS for this leasing table. 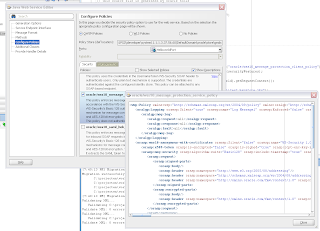 With all the Fusion Middleware releases of late April 2010 its nice to take a look at the security part of FMW & OSB 11g. You may already know FMW 11g Patch Set 2 is a patch on PS1 which was a full release but OSB 11g is a new release. 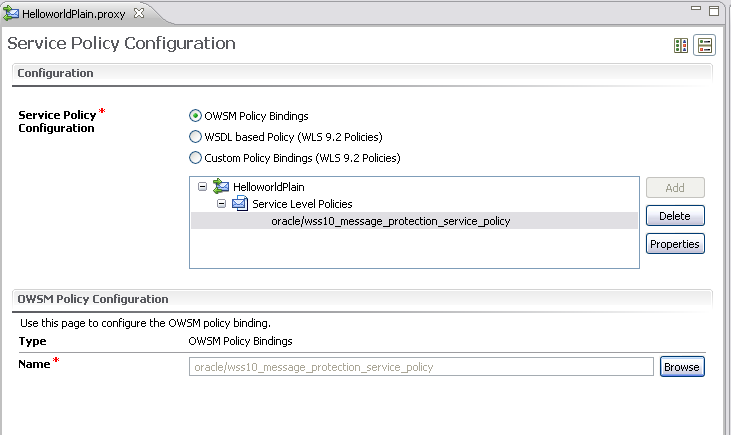 Lets see if Oracle changed WSM in PS2 and what they did with the Weblogic 9.2 WS-Security policies in OSB 11g. Lets start with WSM in PS2, I did some checks and came to the conclusion that it works the same as in PS1, so my WSM in FMW blogpost is still valid. 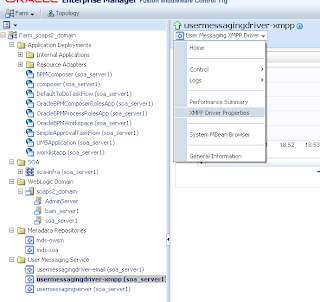 The only thing what changed is that JDeveloper 11g PS2 give you more information about the WSM policies. 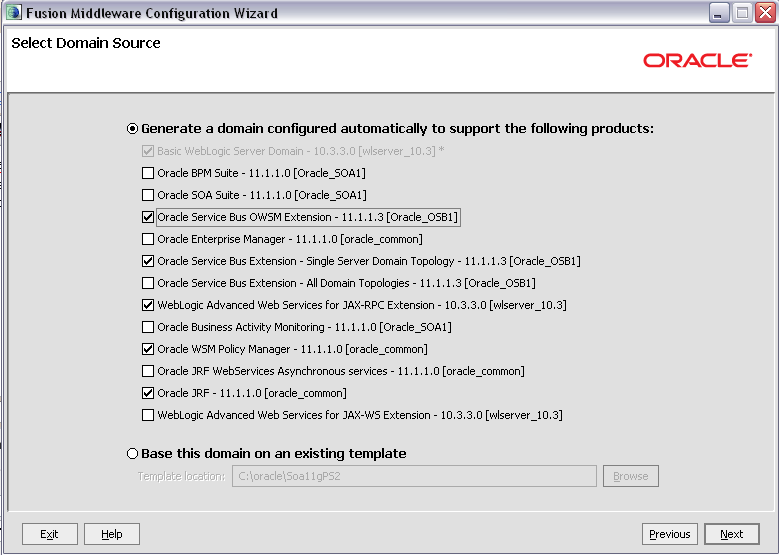 To use WSM in OSB 11g you need to have a MDS repository and extend the OSB Domain with the WSM components. It works the same for an OSB business service only now you use the client policies. Before you can test these WSM policies you need to follow the steps of my FMW WSM blogpost . 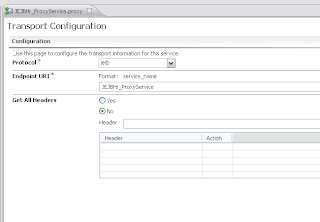 If you configured the WSM keystore then you can test the proxy service in the service bus console application ( sbconsole) . 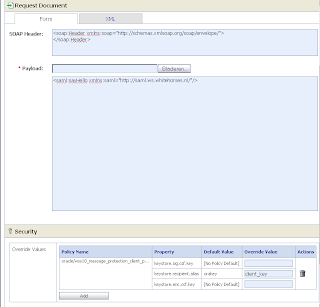 In the security part of this testpage you only need to provide the keystore.recipient.alias. Leave the rest empty. 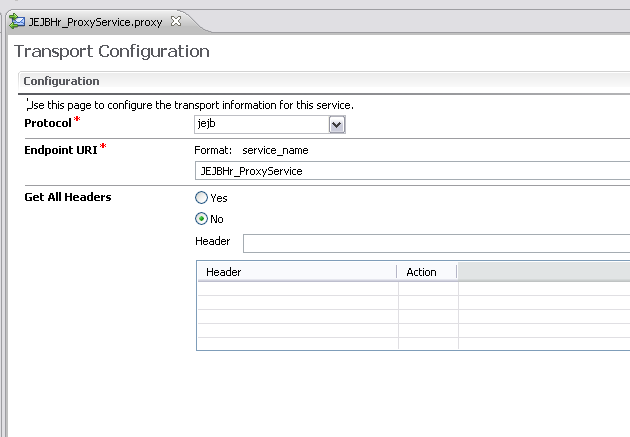 Or you can generate a web service proxy service in JDeveloper and use this in your Proxy client. 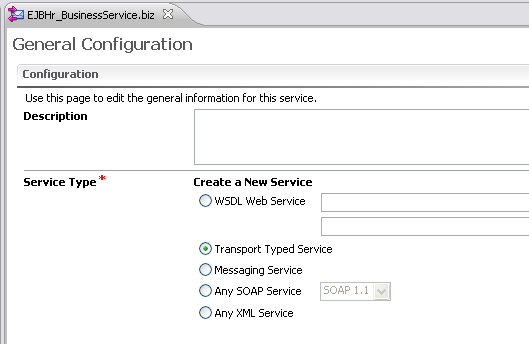 With User Messaging Service you can let Soa Suite 11g do all your Messaging. And UMS can do a lot: like Email with Attachments, Instant Messaging (XMPP, like Google Talk), SMS Text messages (SMPP), Fax or Voice Messages and deliver messages to the Soa & Webcenter Task List. Besides this, UMS keeps track of delivery status information provided by messaging gateways and makes this information available to applications so that they can respond to a failed delivery. 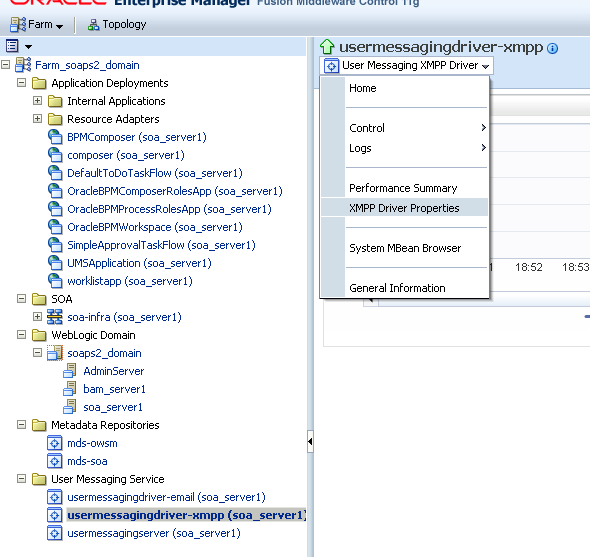 In Patch Set 2 of Soa Suite 11g Oracle added a simple java API for UMS and in this blogpost I will use this API in a EJB Session Bean with a Remote Interface and also expose this Session Bean as a Web Service. This Session Bean & Web Service can be used in your custom applications so you don't need to have or build your own messaging methods because Soa Suite can do more and much better and even keeps track of your messages. Just call the Web Service or the Session Bean, deliver a list of Receivers with names and the media delivery type and it will return a MessageId with this you can check the status of your send messages. 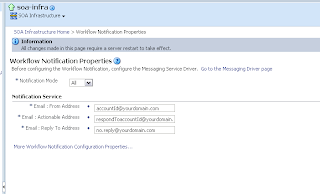 In this blogpost I will use the email and instant messaging driver to deliver my messages. And as a demo I can send email attachements, deliver a message to IM and Email Client. ( Multi part Message , plain text part for IM and HTML part for Email ) and at last get retrieve the status of these messages. 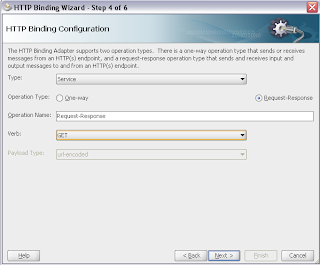 And you can use this in SoapUI, a web service proxy or in a EJB java client. First you need to enable and configure the UMS Email and Instant Messaging Driver ( XMPP). 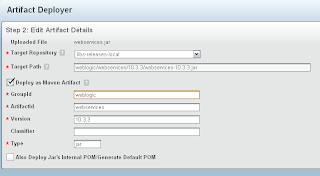 Go to the Weblogic console of your Soa Domain probably http://xxxxx:7001/console and select the XMPP UMS driver and go the the target tab and enable the Soa servers or soa cluster. You need to reboot the Soa Server managed Servers. In the User Messaging Service part of the Enterprise Manager Website http://xxxx:7001/em you can select the xmpp driver and go the XMPP Driver Properties. In my case I will use Google Talk as IM service. Provide the server and a Talk user account. Do the Same for your UMS Email driver. Provide the SMTP server. 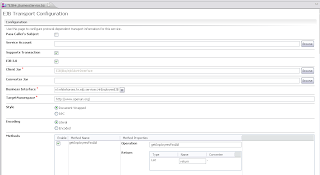 And enable all the Work Flow communications in the WorkFlow Notifications Properties page of the Soa Infrastructure part..
Now you can go to the developer part and create a JDeveloper project and add an new Application. Your project needs to have the UMS library located at jdeveloper\communications\modules\oracle.sdp.messaging_11.1.1\sdpmessaging.jar and your application also needs to have a reference to the oracle.sdp.messaging shared library. 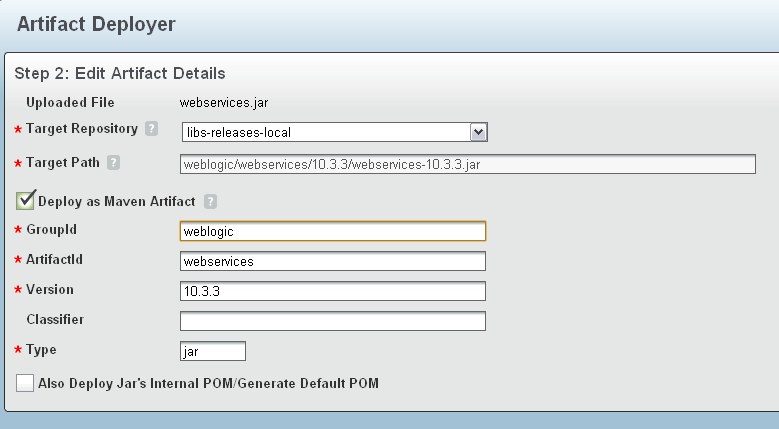 Do this in the weblogic-application.xml. 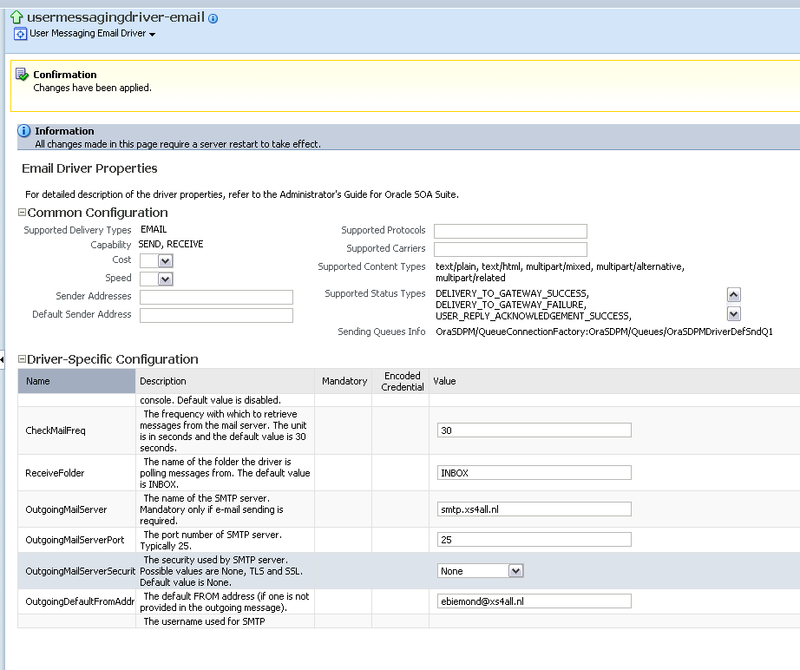 This EJB / WS needs to deployed on the Soa Suite Managed Servers. To make things more simple I made two entities Receiver and Status. The Status entity gives some simple info about the send messages. Here the main code with three method sendMailAttachmentMsg, sendMixedMsg and getMessageStatus. The sendMailAttachmentMsg method will only send Mail with Attachments and sendMixedMsg method can send messages to Google Talk and Email, it depends on the receivers and getMessageStatus returns the Statusses of the send messages. 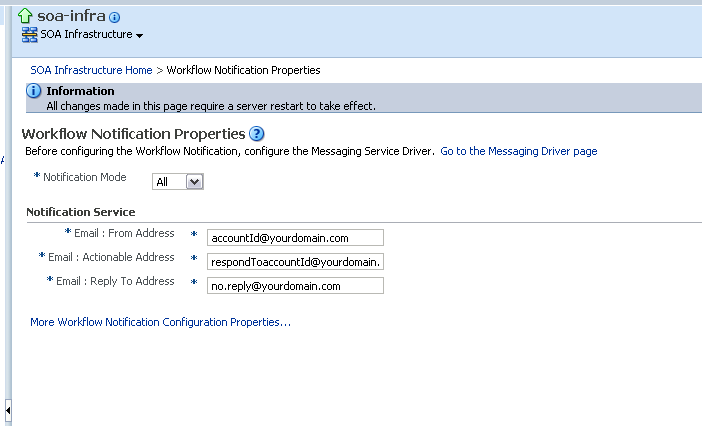 If you send messages with this EJB Session or WS then you can take a look at the application client in the UMS service overview. Here you can download my example workspace.